When I first saw this I thought “what’s the big deal?”. It appears to just be a polyester zip-up cover. But my curiosity peaked when I saw it had over 35 Amazon positive reviews. Some even said it’s the “Best Seal for a Huge money Eating Hole in Your Ceiling”. Home owners like it’s flexible to conforms to any crazy surface your attic may have. 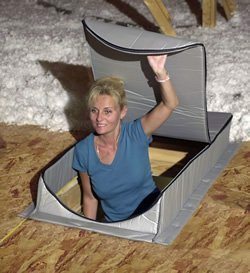 The zippered access makes easy entry and this sytem seals tightly, adequately sealing the attic from your conditioned space. Some users report a $20-$30 monthly energy savings. See the Attic Tent AT-2 reviews here. This may appear as simply a cardboard box shaped to fit your attic stairs opening but it does provide the greatest insulating property from all the products. A R-50 Reflective Insulation protects your home from extreme attic temperatures. 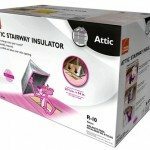 Battic offers a selection of unique insulating products including an ingenoius inflatable fireplace plug “Draftstopper” and a Whole House Attic Fan Cover. Purchase Battic Door Attic Access Door Insulation Kit here. Below is a video highlighting the Battic Door and some of Battic’s other energy draft stopping products. 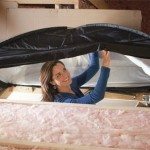 Although this attic access insulator checks in at only a R-10 insulating value, the real value is in the price of this option. It would be easy to add an additional layer of insulation or reflective foil to this cover for even greater thermal properties. Most insulating access covers cost between $100 and $200. The Owens Corning model cost just a bit north of $50 and is super easy to install, just unfold and you are ready to go. Are you a Do-It-Yourselfer who enjoys the thrill of accomplishment while saving money? 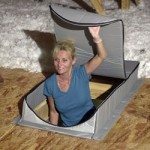 This short video shows you exactly how to build your own insulated box to provide and energy saving seal to your attic space. Here’s a great option if you are on a budget. If you can pitch a tent, you will have the Attic Tent by Duck Brands ready to install in just a few seconds. It’s basically a small lightly insulated nylon tent. Designed not to interfere with attic ladders, but you may have a bit aggravation (as with most products) trying to position the tent while closing an access cover if you don’t have a pull down ladder.